Ideal for temperature controlled storage and distribution services the cold stores are built with strong reinforced insulated flooring. Insulated panels provide solution to the numerous insulation problems occurring in light weight prefabrication. One of the common applications of the insulated panels is the building of cold rooms and refrigerated vehicle bodies. For this application, insulated panels find wide use around the world due to its characteristic to provide maximum thermal insulation. Over the last 48 years, TSSC has been at the forefront of this specialized industry manufacturing high quality panels to the satisfaction of its large customer base. The harsh weather conditions in the Gulf region have been a driving force for the increasing demand for insulated panels in the region. Insulated panels have a monolithic sandwich construction which is formed as a result of injecting rigid polyurethane foam at high density between metal claddings. TSSC offers its customers a wide range of cladding materials to choose, depending on their application requirements. TSSC manufactures insulated wall, ceiling and floor panels to customer specified sizes that are used in building cold rooms for chiller and freezer applications. The stateof- theart production facility spread across Sharjah and Dubai uses 15m (49.2ft) long press and manufactures panels in lengths of up to 15m (49.2ft). 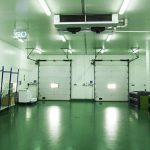 Depending on the size and use of the cold room, cold rooms can be broadly classified as walk-in cold rooms and warehouse cold stores. 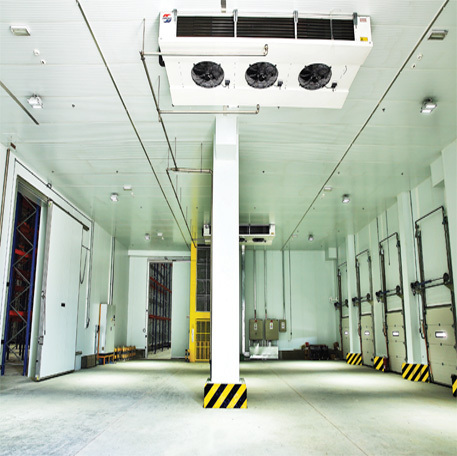 Cold rooms are built by TSSC to maintain a temperature range of 15°C to –40°C. 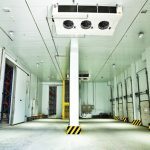 Walk-in cold rooms are smaller in size compared to the large warehouse cold stores and are used primarily by the retail industry to store goods with fast shelf replenishment rate. Due to the small size of the rooms, the insulated floors are built strong enough only to allow the use of hand carts and not suitable for large power equipments such as forklifts. A few uses of walk-in cold rooms are in the super markets, hotels, restaurants etc. Unlike walk-in cold rooms warehouse cold stores are very large sized stores used to store goods at very low temperatures for a longer period. These are built with strong reinforced insulated flooring that allows the use of power equipments for loading and unloading goods. 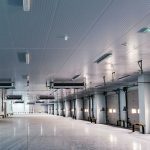 In order to achieve working temperature requirements of 15°C to –40°C, these large cold stores are in most cases fitted with more than one refrigeration unit. Rack power system is the advanced power system used by TSSC in which the refrigeration units are connected together in a racking arrangement. This system provides high energy efficiency compared to the use of ordinary split units. TSSC is the only specialized company in the region capable of installing this system. For quick freezing and chilling applications, blast-freezers and blast-chillers are used where the temperature in the cold room drops to as low as -400C from the room temperature in a span of few hours. TSSC™ is a pioneer in the design, manufacture, supply and installation of these modules and are ideal for sudden freezing of medium sized fish and chicken. The portable skid mounted refrigerators are cold rooms built on a mobile unit in order for them to be used as a mobile refrigeration system. Cold rooms of different types can be constructed to be used as portable units and are always built on a strong steel base in order to provide the unit the necessary strength. These cold rooms find its use in applications that include high mobility including offshore applications. The complete unit is built to the size of a container trailer so that it could be lifted using crane or large fork lifts and moved from one place to another on a trailer or a container. Cold rooms designed with partition walls and doors for different uses can also be built upon the same steel base. TSSC uses a wide range of cladding materials to manufacture insulated panels. Depending on specific customer requirements, TSSC also supplies panels manufactured using other cladding materials. The surface profiles of the insulated panels are made smooth or ribbed depending on the requirement. The manufacturing process of the insulated panels involves injection of polyurethane foam at high pressure between the claddings using a high pressure mixer. The panels are supplied in standard sizes or are custom made to order sizes. The different kinds of panels used in the construction of a coldroom are the wall, ceiling and floor panels. The ceiling and floor panels are manufactured with the same width as the wall panels. Corner panels are used together with wall panels for partitioning in applications where multiple compartments need to be built. The claddings are formed at the edges in “U” shape to guarantee superior adhesion between the sheet and polyurethane and are shallow ribbed to provide additional strength and dimensional stability. The floor panels are made strong to withstand uniformly distributed load of up to 2.5 tons per square meter. Cold room walls, ceilings and floors are assembled by joining together insulated panels in required lengths. The panels are tightly joined by the slip joint system for good structural stability. Slip joint is a unique, interlocking, tongue-and-groove joint technology which has been adopted across the world and provides unsurpassed sealing and waterproofing. It is a well-organized sandwich panel system which utilizes a male female action on the longitudinal joint to achieve superior tightness and insulation. Panels slip into place allowing for easy and rapid installation, whilst improving structural strength and thermal efficiency and also offering a clean, smooth aesthetic look. Insulatedpanels ae joined together in required lengths to assemble length to cold room walls, ceilings and floor. The panels are then tightly joined by a tongue and groove system into a monolithic assembly. For joining the panels together camlocks with steel hooks are used to securely lock them together. The camlocks are moulded and permanently anchored in the injected rigid polyurethane foam core during the manufacture of the sandwich panel. The use of camlocks in connecting the panels makes TSSC cold rooms easily expandable as well as dismountable thus allowing easy reassembly at various locations. At TSSC polyurethane foam is used to insulate the panels. As part of the company’s green initiative, TSSC ensures that all foaming agents are environment friendly and CFC free. Polyurethane is manufactured by reacting a liquid polyol component with Methylene Diphenyl di-Isocyanate (MDI), a liquid polymeric isocyanate component, in the presence of a blowing agent and other additives. The mixed components then react exothermally to form a rigid thermosetting polymer and since the blowing agent evaporates during this exothermic reaction, a rigid closed cell low density insulation product is created. The characteristics of the panel insulation are that it neither deteriorates over time nor does it absorb smell. The panels are neither toxic nor cause allergies and do not support the growth of fungi or mildew. According to European Fire retardant standards, these products are classified as B2. (Illustrated on the side is a list of comparative insulation values for different kinds of insulation materials). 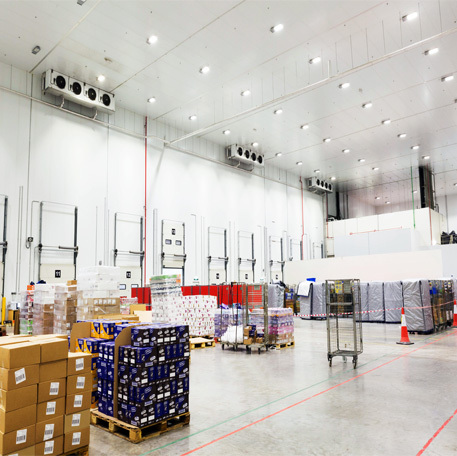 • TSSC Insulated Composite Panels for Cold Stores, Internal Partitions and Ceilings are certified FM Approved for Internal Applications per FM Approvals Standard 4880. The FM Approved panels can be supplied with either Rockwool or PIR insulation. • TSSC FM Approved panels are highly Fire-Resistant and contribute to a reduction of the overall Fire Load. • TSSC FM Approved panels exhibit limited or no flame spread in case of fire. • TSSC FM Approved panels are Self-Extinguishing with limited Smoke Generation. • TSSC FM Approved panels safeguard commercial/industrial properties from fire related incidents thereby protecting the Building Envelope. • Risk reduction translates into business continuity as well as fewer losses and reduced premiums with many leading insurance companies. • UAE government regulatory bodies look more favourably on FM Approved products. FM Global is world’s leading commercial and industrial property insurer with a unique focus on Loss Prevention through engineering. Its clients around the world have relied on FM Approved products for nearly two centuries now. FM Approvals is known worldwide for its focus on testing and certifying only those products which promote property loss prevention. A Class 1 rating from FM Approvals per approval standard #4880 means that TSSC’s insulated composite panels exhibit limited fire spread and fuel contribution and may not require special protection such as sprinklers, when the building walls do not exceed listed heights. Years of research and engineering on Insulated Sandwich panels at TSSC followed by a series of rigorous large scale tests at FM Approvals for performance evaluation in case of Fire and Natural Hazards have resulted in TSSC obtaining the prestigious FM Approval mark. In order to be FM Approved, products need to undergo rigorous testing and to meet the highest standards of quality and technical integrity. FM Approvals standards are generally regarded as being the most rigorous and comprehensive testing standards anywhere in the world. With over 180 years experience of testing and certifying products FM Approvals is a universally acknowledged mark of excellence in Property Loss Prevention. FM Approvals is an ongoing process and ensures continued compliance by annual facilities and procedural audits. TSSC panels with PIR core are recommended for use where improved fire performance is required.The panels are light weight sandwich panels with good cold-retention qualities and a PIR fire retardant core suitable for all insulated applications such as industrial and commercial premises including cold stores. TSSC recommends polyurethane slabs to be used for floor insulation in order to achieve maximum cold room insulation. In the case of small cold rooms, TSSC advises the PU slabs to be reinforced with plywood in order that the load is uniformly distributed and the slab is protected against any impact damage. Depending on the customer requirement, either marine plywood or the standard water boiled plywood could be used. For large refrigerated warehouses which require the use of power equipments such as forklifts, a concrete reinforcement is required over the TSSC™ PU slabs for additional strength. For best results, TSSC recommends the laying of vapour proof barriers such as polyethylene sheets under and above the PU boards. In order to achieve maximum cold room insulation, it is important that the same insulated panels that are used for the walls and floor be used for the ceiling as well. In applications where ceiling panels are long, the panels would need to be suspended from the main structure. The ceiling also is used to conceal the plumbing, electrical and other utilities above the ceiling panels. The panels are built strong in order for it to hold the weight of the personnel walking over the ceiling for the maintenance of these units. The standard width of the panels are 1200mm (47.24”) and are available in the following thickness ranges: 50mm (1.97”), 60mm (2.36”), 80mm(3.15”), 100mm(3.94”),120mm (4.72”), 150mm(5.91”),170mm(6.69”) and 200mm (7.87”). TSSC™ can manufacture panels up to 15 meters (49.2ft) long. Density of insulation can be varied according to the project needs. Cold rooms that require high sanitation standards require the joining bolts to be concealed in order to avoid the corrosive parts being exposed to the cold room. TSSC supplies curving or rounded corner profiles for this application. Some other accessories supplied by TSSC™ include bumpers, internal or external ramps and hydraulic ramps for small cold rooms. Hinged doors are of various types such as single leaf or double leaf, overlapping or flush. These doors are always open in the outward direction towards either left or the right. For applications that require flexibility in the location of the door, TSSC™ supplies retro-fit reach-in doors. If the location of the door would be on a single panel, it could be factory installed. However, if the door space need to be shared between two panels, the hole would need to be size cut at the site. The size of standard doors are 90cm(2.95ft) x 190cm(6.23ft) and are insulated with CFC free polyurethane of density 42 kg / cubic meter(2.62 lb/ft3). The sliding doors are usually used for applications which require larger door openings. It opens and closes with minimal effort and is available with both left and right hand sliding option. TSSC™ also supplies electric sliding doors which are available in either bi-parting or single door models. Doors up to a height of 5m can be fitted for cold rooms of any size ranging from standard modules to large sized warehouses. 1 Durable hardware and attractive hinges and handles built for years of trouble-free usage. 2 Safety release handles that glows in the dark to prevent entrapment inside cold storage. 4 Aluminium or stainless steel railings for very high durability. TSSC installs branded refrigeration systems in its cold rooms that are chosen for their proven consistency and efficiency. However, based on the client requirement TSSC also installs cold rooms without refrigeration equipments, thus providing the flexibility to the client to choose the system of their choice. Walk-in coldrooms are normally equipped with monoblock, split system or individual units. For large warehouse cold stores, TSSC recommends the use of rack power system. TSSC™ is one of the very few companies in the region capable of providing the customer with a rack power system. This involves a special compressor arrangement in a racking style. This system helps in reducing power consumption considerably compared to the use of other refrigeration systems such as split units. TSSC™ uses branded compressors for its rack system to ensure proven quality records. 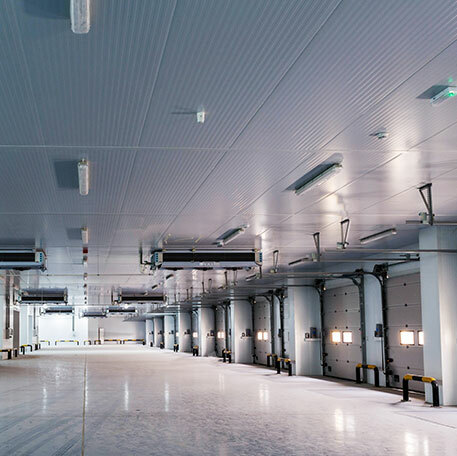 In large sized low temperature cold store applications, it is very likely that frost formed due to refrigeration get deposited under the floor and eventually lead to the cracking of the insulated floor. This would hamper the effectiveness of refrigeration and spoil the goods refrigerated. TSSC™ recommends the use of frost heave protection for such cold stores. The different types of protection available are underground pipe ventilation system and electric floor mat heater. TSSC™ provides assistance in the design of the underground pipe ventilation system and also supplies electric floor mat heater. 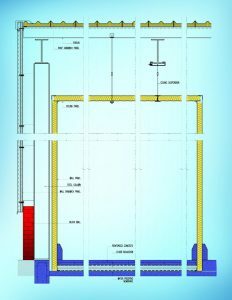 Underground pipe ventilation system involves the laying of pipes / ducts under the insulated floor of the refrigerated room. The pipes with both ends left open are laid at an inclination to allow the flow of water formed due to precipitation. Air circulates through these pipes and prevents the formation of frost that could otherwise accumulate under the floor of the cold store. In situations where underground pipes could not be laid, electric floor mat heater could be supplied as an additional accessory. These mats when laid under the cold store floor provide heating and thus prevent the formation of frost. Project Management With extensive experience in carrying out major projects in the GCC countries, TSSC provides full range of services in constructing cold rooms including design, supply, installation and commissioning of a complete refrigeration plant. The highly qualified and experienced technical staffs ensure that the final product delivered to the customer confines to the highest quality standards set by the company in manufacturing and installation. TSSC could also install a monitoring system for projects that involve more than one cold room. 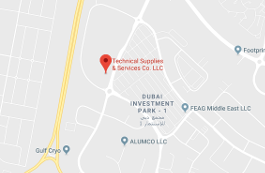 As part of the company’s efforts to satisfy the needs of all its customers, TSSC offers 24-hour service to ensure that all systems installed by the company operate without fail at all times. The large volume of returning customers is an evidence of TSSC commitment in providing comprehensive service to the satisfaction of its clients. TSSC actively involves in the development of new products that meet the diverse needs of their valuable customers. 1. Insulated panels of standard dimension are stacked together in one bundle. 2. Panels of different sizes could be stacked together for easy transportation. 3. In order to avoid any damage to the insulated panels, a PU board is placed atop the first panel of the stack before it is stacked on a wooden pallet. 4. The stack is then covered with a polyethylene sheet covering all sides of the stack. The packing is wound by plastic strings and sealed using polypropylene tape to ensure that the insulated panels reach the customer without any tampering. 5. When panels are transported by container, insulated panels are stacked both horizontally and vertically in order to achieve optimum container space usage. 1. Special crating – For special transportation needs, insulated panels are packed in crates (semi or full) as per the requirement. This provides additional safety for the panels and also helps in minimizing the transportation cost involved in all modes of transportation such as air, sea and land. 2. Corners of the insulated panels are protected using the special foam angles and cardboards for transport using chartered ship/air consignment, break bulk consignment and the consignments that involve both air and land transportation. 3. When long and heavy insulated panels are packed, a thick PU board is placed on top of the wooden pallet in order to give more protection to the panel on the top. Extreme care and attention needs to be given when unloading the panels at the site. This should be done not only for the protection of the panels but also the safety of the handling personnel. Panels should never be dropped onto hard or uneven surfaces or thrown from vehicles. Panels supplied in bundles should be stored on flat even ground able to withstand the weight of both the panels and the lifting equipment. The Polyethylene sheet wrap could remain on the bundle when the panels are stored for short periods provided they are not exposed to sunlight and humidity. For long storage periods, TSSC advises its customers to remove the Polyethylene sheet wrap and store the panels indoors. Using forklift with panels - under “6” meters Spreader bar with slings Using Lifting beam with panels over “6” Meters Long. Both sides of TSSC insulated panels are covered with nylon protective film to protect the panels from scratches. The protective film should only be removed after the panels are installed in order to ensure maximum protection. The protective film could remain on the insulated panel for any storage period. However, for long periods of storage panels should be stored indoors.